MegaUpload, the file-sharing community, has had its physical offices raided by the FBI and its site shut down (although it may be back up) because the U.S. government says it has violated copyright. While others detail what services to use now or who was actually using the service for non-nefarious (piracy) purposes, we were wondering what it meant for the web when a large content sharing site is suddenly taken offline. I asked a few companies that track that sort of thing to see what has happened to Internet traffic over the last 24 hours. Arbor Networks said it saw traffic begin to drop fairly sharply in Europe after about 7 p.m. GMT and 2 p.m. EST, when the site was estimated to have been shut down on Thursday. 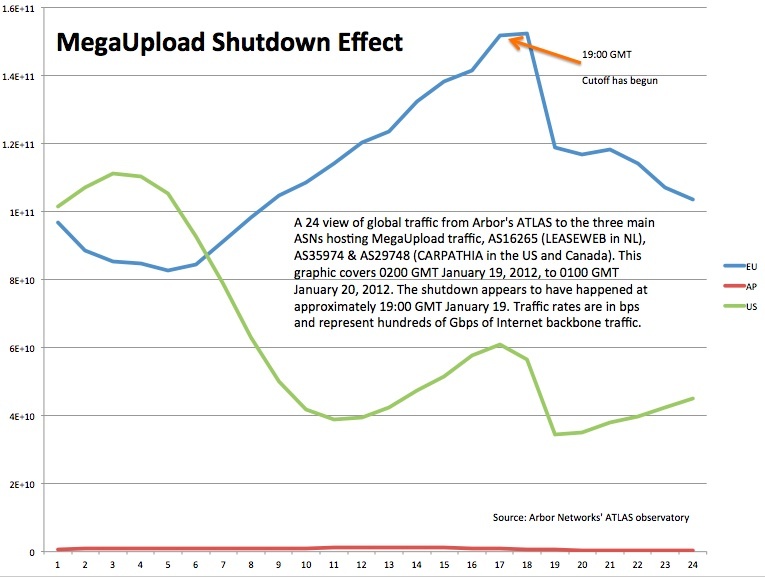 I’ve asked if it also saw a spike in other types of traffic, such as peer-to-peer traffic that might indicate that burned MegaUploaders were turning to BitTorrent, but a spokeswoman said so far, Arbor hadn’t seen anything like that. We’ll update this story if more companies report back. I believe that evil has different levels. It is being calculated that Megaupload was responsible for 500 million to 1 billion dollars worth of losses to studios, now of Megaupload founders are in jail, they deserve it. What about the losses provoked by the financial services industries, they played with everyone’s money, they were responsible for billion or trillions of losses worldwide and only a couple of people are in jail. Megaupload is petty cash compared to other sources of evil. So in my opinion the FBI is very good at arresting people when they are defending corporations, but very bad when they have to catch the bad guys that end up loosing everything because some dudes in wall street decide to be creative with numbers. And to be fair, the money that the financial services lost was real money. It wasn’t just a calculated “assumed” number. I personally don’t buy into the 500M-1B figure. Say a marginal movie comes out and someone thought to themselves “well if it ever comes on FOX night at the movies I might DVR it”. (May have showed my age right there mentioning FOX night at the movies.) But that person never may have spent the $10-$15 to purchase the DVD. Given the option of paying for a movie they had only marginal inclinations to watch in the first place, or going completely without, many would go simply go without. Yes, perhaps if you added up each time the pirated material was viewed by it’s retail value, this may indeed reach the 500M amount. But how many of those viewers would have purchased the movie had it not been offered for free? You also have to imagine the target market of the viewers. College aged, or lower income individuals that just don’t have as much disposable income as the movie producers in Hollywood think they should. I’d imagine the amount of “real” losses is closer to 5% of the “estimated” figure. Tosh from Tosh.0 put it nicely. People will watch anything if it’s free. Just look at all the stupid viral videos on youtube. Cyberlockers are a very small fraction of the real problem. â€Ž33% of all Internet traffic is used to steal music, movies, software, books and games simply on P2P networks. http://tinyurl.com/mk8nm3 – Cisco report page 9. All driven by Internet ad networks. Page 9 of that report doesn’t say any such thing. The real problem are the amoral copyright laws, made for a different millennium. Be gone with them and may the profiteers learn to work for their earnings. I believe your statement its not accurate at all. You call it “to steal”, while others (as the Cisco report) call it “to share”! It’s not the same thing! I like the sharing idea. If I buy a DVD and invite 1 friend to my house to watch it, is it ok? What if I invite 20 friends or give to a friend to watch it over the weekend, is that stealing? Well some people just like to do using new technologies, Kodak just went bankrupt this week, so new is here to stay. By the sounds of how Mr. Dotcom hid in his own home behind doors with electric locks, it seems he was worried that someday someone would come after him.. somebody with weapons. Which brings to mind … that perhaps laws don’t have to reach these criminals, just an elite strike force – just like in the movies! May they live in fear. you are using a copyrighted image as your avatar. special forces were sent to your home to take you down and seize all your assets and kill anyone who stand in between, specially family. have a nice day. Van Gogh died in 1890 – the image is well out of copyright. That doesn’t mean every creative work is automatically back into copyright. Stop scare-mongering. The prior owner of his house ran an unsuccessful Christmas club. Do you think they were worried about angry subscribers coming after them with sub-standard hams?